Amid the ongoing crisis in Venezuela, Wladimir Berroterán thinks there’s a role for entrepreneurship in resolving some of the country’s problems. It’s an industry that, in the United States, is worth about $1 billion, according to the website marketresearch.com. Berroterán says he works with students, business owners, people starting businesses, corporate managers, employees, and others. Many are seeking economic and professional opportunity in a country experiencing profound political and economic instability. By this he means Venezuelans are not strangers to adversity and that it’s part of the national character to seek solutions and opportunity amid hardship. “Right now is a moment of opportunity,” he said. It’s in this spirit that, two or three years ago, Berroterán discovered the Question Formulation Technique, or QFT, and thought it was a tool that could help his clients. “All our training sessions end with a reflection, and we always provide tools for our participants to elaborate and summarize what we’ve done in the trainings,” he said. He found the QFT helped participants advance their work and provide more focus. Their priorities mostly pertain to the world of business. When leading clients through a QFT session, Berroterán presents them with Question Focus prompts such as “organizational environment,” “leadership,” and “bad management.” Participants use the QFT as a diagnostic tool to assess organizational problems and ask deeper questions about them. It helps clients pinpoint issues they weren’t able to identify without the QFT and establish a plan of action, Berroterán said. Berroterán has not used the QFT outside his role as a coach, but he thinks it could make contributions to resolving the broader situation in his country. He said it’s a tool that could be used in community meetings “not just to talk about problems, but to ask questions about what we can do.” He added it could help Venezuelans reflect in a “more constructive” manner. The QFT helps change that mindset, he said. It sharpens people’s questions — and minds — so they can establish a plan of action and become part of the solution. It’s a way forward that has relevance beyond Venezuela’s borders as well. 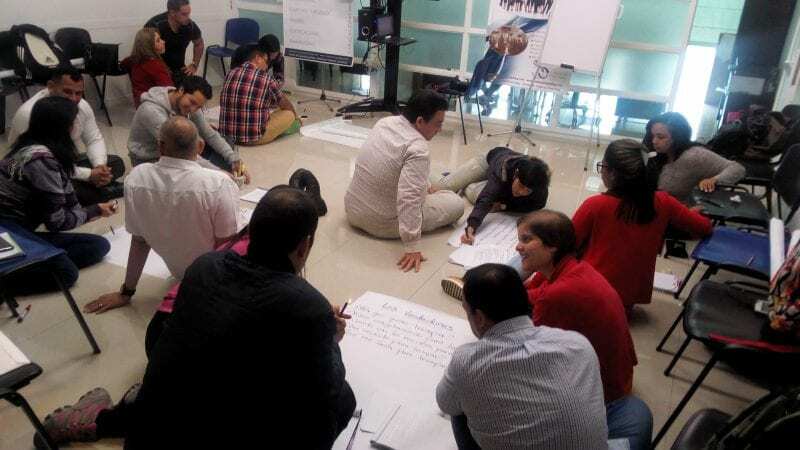 Photo: Entrepreneurs, business owners, corporate managers, and other participants use the Question Formulation Technique in one of Berroterán’s training sessions. Courtesy, Wladimir Berroterán.